Gilbert Keith Chesterton, often described as a “A Christian journalist” was an important personality in Beaconsfield. Although GK was a student at the Slade School of Art in London, his primary talent was writing. He married Francis Blogg in 1901 and settled in London. However, a few years later, the couple decided to have a “sort of second honeymoon”. They caught a bus at random and then a train which happened to stop at Slough. From Slough they walked “through Beech woods” to Beaconsfield staying at The White Hart and deciding that Beaconsfield was where they would like to live one day. It was not until 1909 that the Chestertons finally arrived in Beaconsfield and by this time GK was a well known writer. 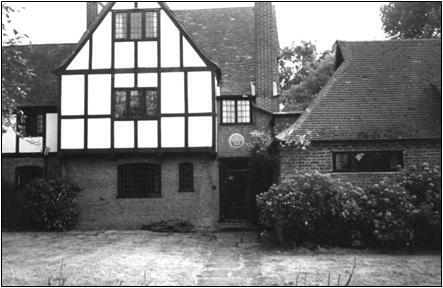 They rented a newly built house in Grove Road called Overroads and, not long after this, they purchased Top Meadow, a plot of land across the road where they had a studio, study and house designed by Walter Holden. The studio and study were built in 1922 and the main Arts and Crafts style house built in stages during the 1920s and 30s. Francis planned the garden which included a honeysuckle bush grown from her wedding bouquet, a fishpond and a wildflower meadow, parts of which were given over to the Chesterton donkey who was called Trotsky (the name referring not to his political opinions but to his lively walking pace). GK did his writing in his study at Top Meadow for the rest of his life. In 1922 Chesterton was received into the Roman Catholic Church; Francis converted a few years later. . Many friends and acquaintances from the world of journalism, literature and the arts came to Top Meadow. These included George Bernard Shaw, Walter de la Mare (who lived at Penn) and Father John O’Connor, who was the original model for GK’s Father Brown stories. GK was an enthusiastic member of the local community and was a familiar figure in wide-brimmed hat and cloak. He was a regular at The White Hart and also patronised Mr Harding, the barber in London End, where he was not above bribing waiting schoolboys with sixpences to enable him to jump the queue. (It seems that the boys grew wise to this and several were sure to be there when GK entered). GK died in 1936 and is buried in Shepherds Lane Cemetery. His wife Francis and his Secretary Dorothy Collins, are buried in the same plot; the headstone is a carving by the sculptor Eric Gill. 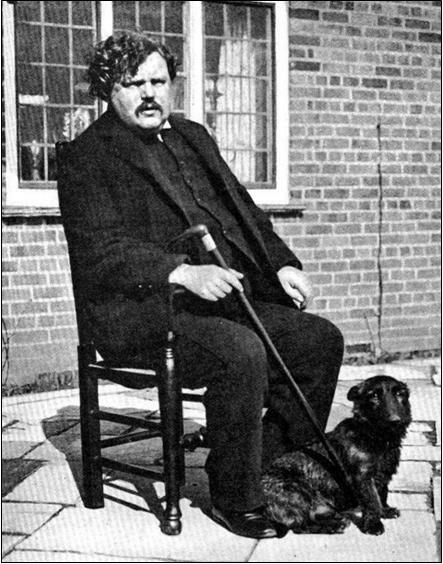 Top Meadow has a blue plaque over the front door commemorating Chesterton’s life in the house. St Theresa’s Roman Catholic church in Warwick Road has many artefacts associated with Chesterton, including a statue of Our Lady, and the tower end of the church with its Martyrs Chapel was completed as a memorial to him. Chesterton Green, off Maxwell Road, is also named after him.